This week’s Instagram Photo of the Week comes from 14x World Champion, Executive Vice President of Talent, Live Events and Creative of WWE and Creator of NXT, Triple H.
As I’ve mentioned in one of my previous Superstar Tweet of the Week posts, I feel Triple H has a parental role with the Superstars of NXT. Triple H is with these NXT Superstars from the day they arrive to the day they debut on the main roster, so acting as a father figure would only come natural to the father of three. He teaches them, helps them grow, and loves them all throughout the way; even when they leave the nest and onto bigger and better things. Triple H was backstage at Smackdown Live this Tuesday and took this photo with Smackdown Live NXT draft pick, “Hype Bro” Mojo Rawley. I love this. I’m someone that thrives off of motivational and inspirational quotes as well as people. Triple H undeniably being one of them. Not only were his words inspiring, but the photo itself speaks volumes. Clearly, Mojo chased his dreams in this fashion as the results of his dream and hard work led him right to Smackdown Live. If Mojo among so many others can do it, so can you. Believe in it, chase it and keep your momentum going, even when you feel like you can’t take another step. Be sure to follow Triple H (@TripleH) and myself (@wwebloggingbetty) on Instagram! This week’s Instagram Photo of the Week comes from one Certified G and Bonafide Stud, Enzo Amore. The feud with AJ Styles began when The Club outnumbered and overpowered John Cena one Monday night on Raw, in which Enzo and Big Cass came to Cena’s aid. The comment of AJ Styles having “soccer mom hair” first started on Twitter, which Enzo reiterated a few weeks later on Monday Night Raw which went viral within The WWE Universe. Soon, you heard it in chants, read it in tweets and even memes. Speaking of which…. Enzo Amore made his own reference to AJ Styles’ “soccer mom hair” and posted it on his Instagram page Wednesday. I know it’s not your typical meme but it’s still silly! Be sure to follow Enzo Amore (@wweaaLLday21) as well as myself (@wwebloggingbetty) on Instagram! This week’s Instagram Photo of the Week comes from the new Commissioner of Smackdown Live!, Shane McMahon. This is so Shane. I’m not a big shoe person but I have to admit that these are really, really cool! As Commissioner, he should wear them every Tuesday night on Smackdown Live! as it would be appropriate to do so! Knowing Shane’s love of shoes, I’m sure he’ll have a new pair on every other week HAHA. Be sure to follow Shane (@shanemcmahonwwe) as well as myself (@wwebloggingbetty) on Instagram! This week’s Instagram Photo of the Week comes from one half of The Dudley Boyz, D-Von Dudley. We have all seen the horror consume our television, the air waves and every newspaper of the deaths caused by racism and hate. It has separated many as they fight for one side but there are also many who fight for all, for equality, and for unity. 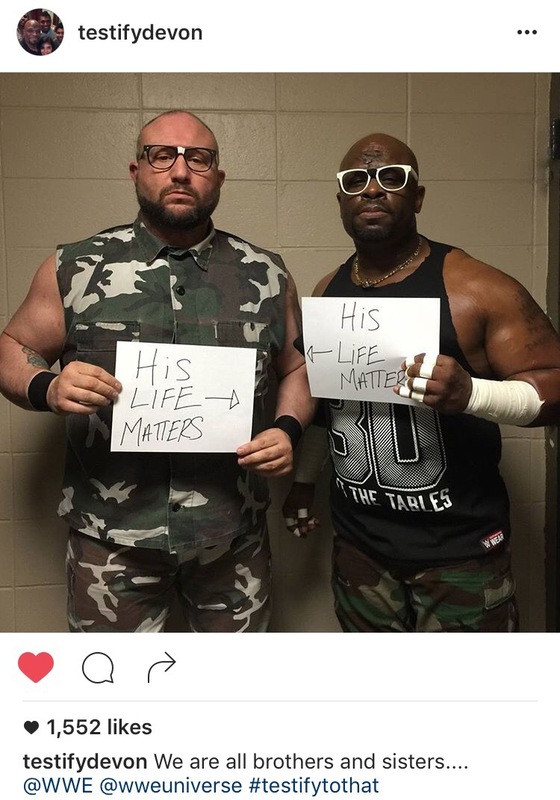 D-Von and his brother Bubba Ray are two of these individuals who fight for all as D-Von posted this photo on his Instagram page last Sunday. We all need to come together, to look past the color of each other’s skin, and live this beautiful life to the fullest. We only get one opportunity at life, so why fill it with hate? I hope as the days move forward from the tragedies that have occurred, we can all come together and show each other nothing but compassion, love and humanity. The world truly needs it now more than ever. Be sure to follow D-Von Dudley (@testifydevon) as well as myself (@wwebloggingbetty) on Instagram! This week’s Instagram Photo of the Week comes from none other than the Certified G and Bonafide Stud, Enzo Amore. Enzo celebrated this week’s #TBT (also known as “Throwback Thursday”) by posting a photo of himself with a friend the last time he was a fan sitting in Madison Square Garden at a WWE show. He stated the various matches he had witnessed in that very building and how he is still a fan of the industry. I love seeing these kind of posts from WWE Superstars. It shows they chased their dreams relentlessly until they came true. It also shows that even after the success they’ve obtained, they are still humble and still – and always will be – a fan of World Wrestling Entertainment. It’s a great way to relive those memories as well as see how far they’ve come. I know one day, I’ll be doing the exact same thing. I hope each and every one of you can say the same about your goals, dreams and aspirations. This week’s Instagram Photo of the Week comes from Tough Enough winner and member of the NXT roster, Sara Lee. If you don’t follow Sara on Instagram, then you’ve been missing out. She is now the proud mother of a Bulldog puppy that she’s named Butter (BUTTER! If I could insert numerous heart-eyed emojis in a row right now, I would) and like any proud mother, Sara has been showing him off in photos and videos. On Monday, she posted this absolutely adorable and funny photo of her furbaby admiring his own cuteness. Clearly, all of his mom’s words of love and affection went straight to Butter’s head! You can follow Sara Lee (@toughsaralee) as well as myself (@wwebloggingbetty) on Instagram! This week’s Instagram Photo of the Week comes from WWE Superstar Summer Rae. All of us have a dream, a desire, a vision. Sometimes, you have to take a leap of faith to make your life one to look back on with nothing but smiles and satisfaction. Summer Rae did just that. Chicago is where it all started for Summer and she paid homage to the Windy City while there this Thursday. Be sure to follow Summer Rae (@daniellemoinet) and myself (@wwebloggingbetty) on Instagram!